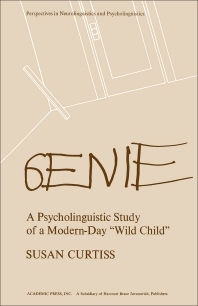 Genie: A Psycholinguistic Study of a Modern-Day “Wild Child” reports on the linguistic research carried out through studying and working with Genie, a deprived and isolated, to an unprecedented degree, girl who was not discovered until she was an adolescent. An inhuman childhood had prevented Genie from learning language, and she knew little about the world in any respect save abuse, neglect, isolation, and deprivation. This book is organized into three parts encompassing 11 chapters. Part I provides a case history and background material on Genie's personality and language behavior. This part describes the interaction between the authors and this remarkable girl. Part II details Genie's linguistic development and overall language abilities, specifically her phonological development, as well as receptive knowledge and productive grammatical abilities of syntax, morphology, and semantics. This part also provides a comparison between her linguistic development and the language acquisition of other children. Part III presents a full description of the neurolinguistic work carried out on Genie and discusses the implications of this aspect of the case. This book will prove useful to neurolinguistics and pyscholinguistics.